Yes. We made our own grooms cake. Yes. We may be a little crazy. Yes. It all turned out better than I could have ever dreamed. Tyler loves an Oreo moment. He especially loves a Target Cookies and Cream cake moment. So, a few birthdays back I started working on a Cookies and Cream buttercream for him. The first year was a total bust, but last year’s was SPOT ON. Naturally, when we were cake tasting, we had to try all the Cookies and Cream flavors to see just who might be able to capture the essence of flavors he loves from my cake (and Target’s). On our third tasting, he looked over and said – none of them are better than yours… or Target’s. I’m not much of a baker. I like to bake, but I don’t dream of baking. I dream of baked goods – but I don’t really care if I’m the one to make it happen. However, I do love the tradition of a homemade birthday cake. I’m thinking that’s because for MY ENTIRE LIFE my mother went OVER AND ABOVE on EVERY cake I had. I ask you – why would my wedding cake be any different?! Anyways, I want to continue this tradition with my family. To do that – my cake skills have got to get better. So… I practice every time someone who loves me has a birthday. Tyler’s go-to cake is a mix of my mom’s (Hershey’s) chocolate cake recipe with some added oreos and Cookies and Cream Frosting. A chocolate cake is a blog post in and of itself, and I’ll leave that to the pros. However, I’m a firm believer that anyone can make a great frosting. This my friends is a great frosting… a great buttercream to be exact. When mom decided she was going to make Tyler’s groom’s cake for the wedding... I knew this had to be the filling. It was so fun making the groom’s cake with my mom. It really was a group effort. Amy was there and lended a hand. Literally. 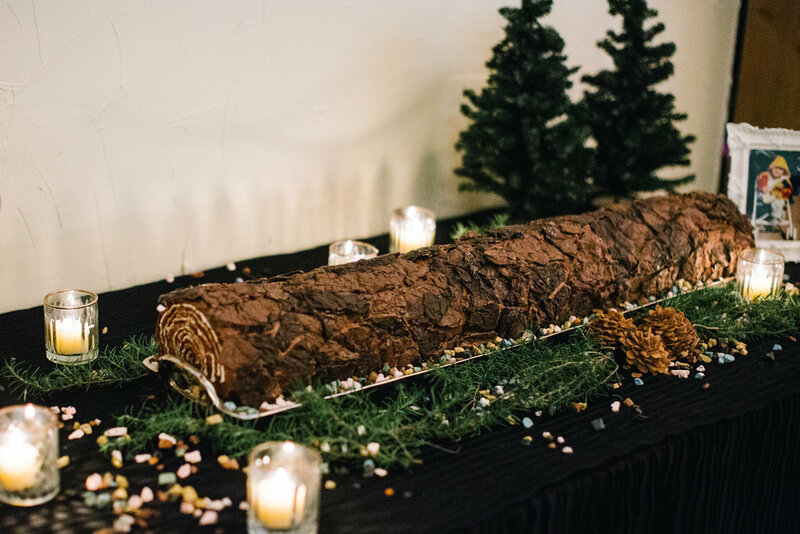 Weeks before the wedding the whole family was making ‘tree bark’ from all types of chocolate, and the delivery of this 3+ foot cake took a whole team. 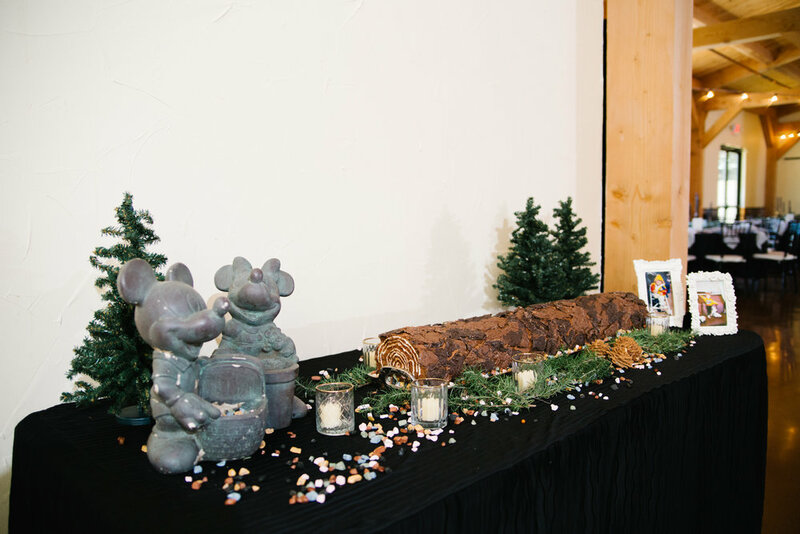 I love that on the day Tyler officially became one of the bunch he got his very own, specialty cake made by the whole family. Not only was it adorable... it was sooooo tasty. Large in part - if I may say so myself - because of the Cookies and Cream filling. 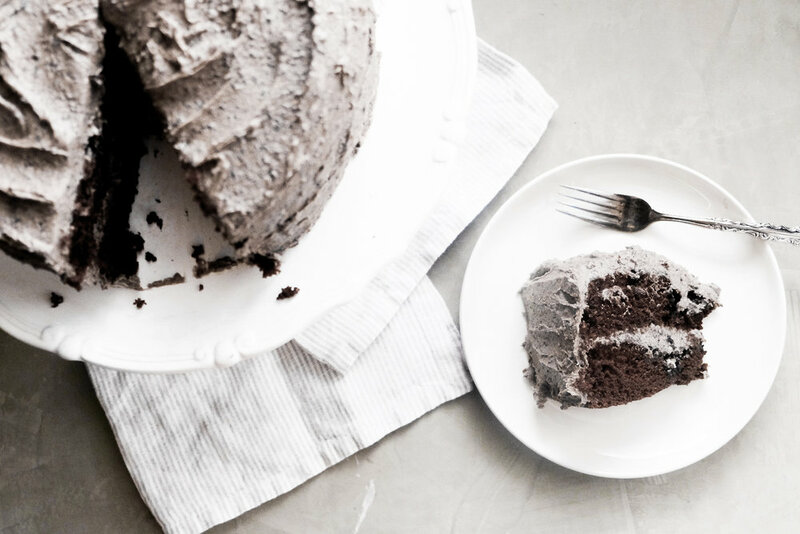 So, if you’ve got an Oreo lover in you clan... they’re sure to love their homemade cake if you slather this oh so delicious Cookies and Cream frosting all over it. I do everything in the food processor. If you don’t have a food processor, you can use a hand mixer. Take the double stuffed Oreos and separate the cream filling from the cookies. Take the cookies and pulse in the food processor. Pulse until course. Remove the cookies from the food processor and add the cream cheese, butter, and salt. Pulse until smooth. Start adding the powdered sugar in small batches. About 4 cups in add the half & half and vanilla. Next, add your cookie crumbs in to the frosting mixture. Pulse until well incorporated. Don’t mix for too long or you Oreos will virtually disappear. Now - place in the fridge for 10 to 15 minutes to let it set up. Once you’re ready to frost your cake, remove it from the fridge and let set at room temperature for 5 to 7 minutes. This stuff freezes BEAUTIFULLY! I made this like a month before the wedding and it held up great!